Make sure to use “real” ingredients in your baking. I’ve always loved how butter brings out such a rich melt-in-your-mouth taste to your gluten free recipes. Every time someone asks me how come one of my cookies or muffins tastes so much better than theirs, the first thing out of my mouth is…Did you use butter?Â 9 times out of 10 the answer is …Well, no. I thought it wouldn’t make much of a difference. They couldn’t be more wrong. Butter flavor surpasses any copy cat and it’s ability to tenderize is nothing short of heavenly. It coats our gluten free flour and just makes it melt in your mouth. Try some of the cookie recipes here and in my book The Gluten Free Cookie Jar and find out for yourself. There is no true replacement for butter. So, what kind should you use? The freshest batch possible is my first answer. Always check the freshness date on the package. If you can afford to buy organic butter, great. If you live near a dairy and they make it fresh..WOW! Can I come and stay with you for a few days. I want to buy some and ship it home pronto. Then there’s the age old debate: unsalted vs. salted.Â Many of the more professional cookbooks and magazines will tell you to go the unsalted butter route. They feel that unsalted gives you more control over the total amount of salt in your cookies or cakes or breads,etc. Salt is also a preservative, meaning that salted butter will stay “fresh” longer than unsalted and it can also mask some off flavors more effectively. I say, try both and see which you prefer. You might decide that unsalted is right for you in baking and then again you might not. Try them both and see. They cost the same amount of money and you can finally decide for yourself. Don’t let others dictate what you want to do. Not even me! Keep your butter as fresh as possible by tightly wrapping it and storing it way in the back of your refrigerator. The colder the better! If you find a gonga deal and buy 20 packages that will last you for 7 months, go ahead and wrap it up and freeze it. Keep it ice cold for things like pie dough, scones, biscuits and puff pastry. It’s best to cut it into small cubes and then quickly incorporate into your flour. I love a food processor for this. The fast short cutting bursts really do a great job, and it keeps your hands from warming up the butter and making it too soft. Softened butter is used for creaming into sugars and then flour for cookies, cakes and some pastries. This is where the butter and sugar join together and create wonderful air pockets that lighten your baked goodies. And heaven knows gluten free goodies need as much of that as possible. Softened butter should be bendable but not too soft. For you techno geaks out there, you can check your butters temperature. For soft it should be between 65 degrees and 67 degrees. Use an instant read thermometer. For the rest of us, if you can bend your stick of butter without it breaking or your fingers digging into it, that’s about right. Then stir it with a spoon. The rest should melt and you will be ready to add it whatever you are making. Just make sure it’s not hot. If it is and you add it to beaten eggs, you’ll end up with eggs scrambled in hot butter. Doesn’t sound too bad but not good for baking. 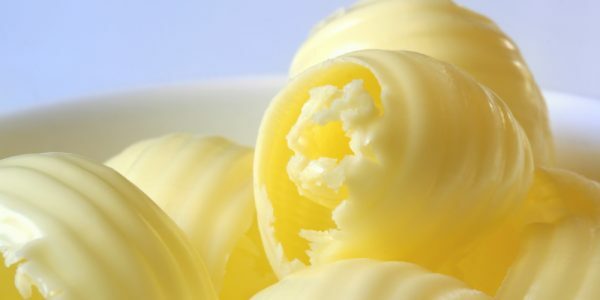 So there you have it, a quick primer on one of natures most wonderful foods: Butter! Check out our cookbook The Gluten Free Cookie Jar for lots of yummy recipes. Click here!